It’s always a good idea to meet with your group ahead of time to discuss stops for food, fuel and places to rest. During the meet up, you should always communicate with your fellow riders to ensure everyone is trained, has a motorcycle endorsement and to determine the speed and duration of your trip together. Be sure to coordinate who will have repair and first-aid kits if not everyone plans on carrying one. In most cases, not everyone in your group will be at the same skill level. It is important to discuss this during your group meet up so you can address any potential issues before you hit the road. While riding, always keep an eye on your rearview mirrors; if the person behind you is falling back, gradually adjust your speed to allow them to catch up. Don’t try to match anyone’s speed if you aren’t comfortable doing so; ride at your comfort level, back off from other riders and don’t show off. If you’ve planned the ride well, you will know your next meeting place and can regroup there if there are any issues. To ensure a safe, successful group ride, there should always be an experienced rider in front to lead the group. It is also just as important to have an experienced rider in the back of the group, called a tail or sweep rider. The lead rider’s job is to navigate and look for hazards ahead of the group. The lead rider should signal ahead of time, take slower turns and try their best to not make any sudden stops. The tail rider’s job is to keep an eye on the group and lend a hand to anyone that has engine trouble or can’t keep up. The tail rider should always have a fully charged cell phone in case of an emergency. The least experienced riders should be in the front of the group behind the lead, followed by the seasoned riders. 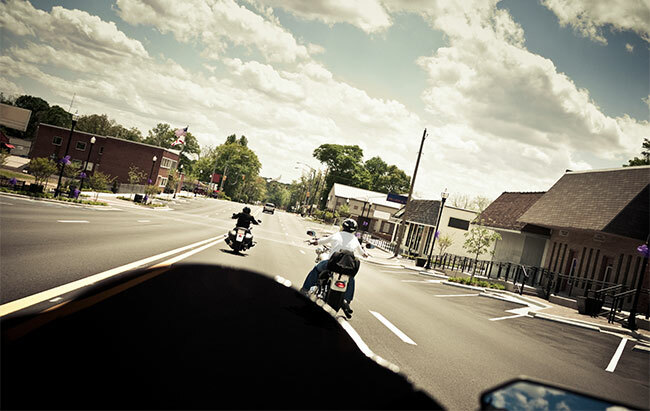 You should never ride side-by-side as to allow each rider room to swerve and react to hazards on the road. Your formation should resemble a zigzag pattern with the lead rider on the left side of the lane and the next rider on the right side, one second behind, etc. It is important to keep a safe following distance while still maintaining a tight formation for other vehicles to pass. One of the most common causes of motorcycle collisions while in a group ride is from not giving those around you enough space. Keep in mind though, that when passing and in areas with low visibility or tight turns, it is better to break up the formation and go in a single file line. How about a discussion of bright colored clothing, helmet, and motorcycles as opposed to the ever popular black. My bright orange vest can be seen further than the loudest pipes can be heard. 52 years riding safely. Never assume your are seen on a motorcycle! I ride w pink helmet and pink leather and still not seen!Ride safe. driving in a safe and sane manner, always with 100% of your attention on your driving and especially on everything – especially vehicles and pedestrians, for potential threats. Group riding does not allow you to stop traffic and run red lights! Blockers are taking huge chances of injury or even death, from inconsiderate or distracted cage drivers. The Road Cpt. needs to inform the whole group of the intended route between stops, so that those caught by lights or heavy traffic can safely proceed in the right direction in order to catch up to the slower (waiting to allow catch-up) lead group. Corner making is a must on group rides. Not everyone will know where to go. A experienced rider at the front is important but just as important is a experienced tail end Charlie. And always within your riding abilities. Leave 20% in your pocket. We tout the “two second rule” when driving a car for safety reasons but when riding motorcycles as a group that leads to a host of other problems such as motorists cutting off bikes at exit/entrance ramps. Since we typically ride “tighter” as a group, your attention and reaction time must be super heightened. It’s too easy to get entranced in the coolness of a group ride !! Ride Safe ! When you think you are up on all the motorcycle safety proceedures you read this. Thanks Michael for showing there is always something to learn. Keep up the messages.